I need to get a tax disc. In order to be allowed to get a tax disc, I need to get an MoT certificate. That’s simple – the motoring bit of Directgov has a well-deserved reputation for being one of the most useful areas of the site. 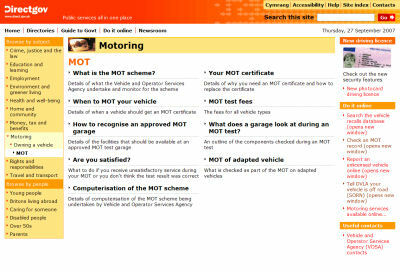 Step 1 – Look for MoT information – and easily navigate to an information-rich page. It is ready to tell me what an MoT test is, when I need one, what actually gets tested, and what to do if I am unhappy about it. What it doesn’t tell me is the one bit of information I want to know: where I can get one done. A little light googling finds several commercial websites purporting to provide this information (though with suspiciously similar backends). It is completely unclear whether the information they provide is either comprehensive or up to date, and there is nothing remotely as useful as opening hours. One site offers an online booking service – but has signed up all of thirty testing stations across the country, which is not much of a dent in the total of 18,300. Step 2 – Actually find a testing station. It turns out that the most straightforward approach in this bit of south London is simply to follow railway lines, since railway arches seem to be the MoT tester’s natural habitat. I hit the jackpot with three different testing stations in adjacent arches. Only one of the three is in the database – and all of them are closed. Step 3 – Go back when they are open. Test done by efficient and friendly Maltese mechanic who turns out to be bosom buddy to the Maltese builder who does odd jobs for us. I get my MoT certificate – and I also get an advisory notice telling me that there is wear on the brakes. Friendly Maltese mechanic tells me not to worry and that there is not the slightest urgency to do anything about it. The advisory notice doesn’t seem to be very sure what it is. It is printed on a VOSA form, just like the test certificate itself – but the rubric says “They are the personal opinion of the Tester and are not standards set by the Vehicle and Operator Services Agency”. The result is that I am precisely no wiser at all than I was before. Reading the rubric is itself a bit of challenge, since it is printed in orange ink on an orange background. So what’s the point of setting all this out in mind-numbing detail? Even here, in one of the slicker services, the product and provider based approach is not far below the service. The MoT providers are private garages, mostly very small businesses. The strong impression given is that they are seen as being outside the government system and process (particularly odd given the level of integration at the back end). That’s a distinction which is wholly uninteresting to me as a service user. I am very glad that step 4 has been so much improved – but it would be even better if 1 to 3 worked better too. Although the test itself is unavoidably physical, it is the arrangements around the test which create the sense of hiatus, not the test itself. It’s an information problem, which ought to have an information solution. I was surprised at how confused I was by how the regulatory and advisory elements came together. Putting the reference to the “where’s my tax disc?” service at the end of step 4 is a smart move – but if it’s worth mentioning, why can’t it be a dedicated phone number, rather coming at the end of a menu tree? There’s an idea which floats around that fewer telephone numbers is good, more is bad. But this seems a pretty clear example of why that’s just too simplistic a way of thinking about it. So plenty of food for thought – and I have only had to pay HMG £230 to prompt the ideas. You will find in 11 months time that DVLA have completely missed out on step 5. They are quite happy to send out a reminder that you owe them money for the Tax Disc, but although they now know when you MOT expires they will not send you a reminder.